I’m in the middle of no less than 3 projects at the moment that would each be made that much easier if everyone involved could work collaboratively on various documents. Artists, teachers and museum staff; lists, budgets, plans and texts. Here then is a quick guide for the uninitiated. We’ll work through setting up a Google account and from there you can access a whole new world of getting things done more easily! 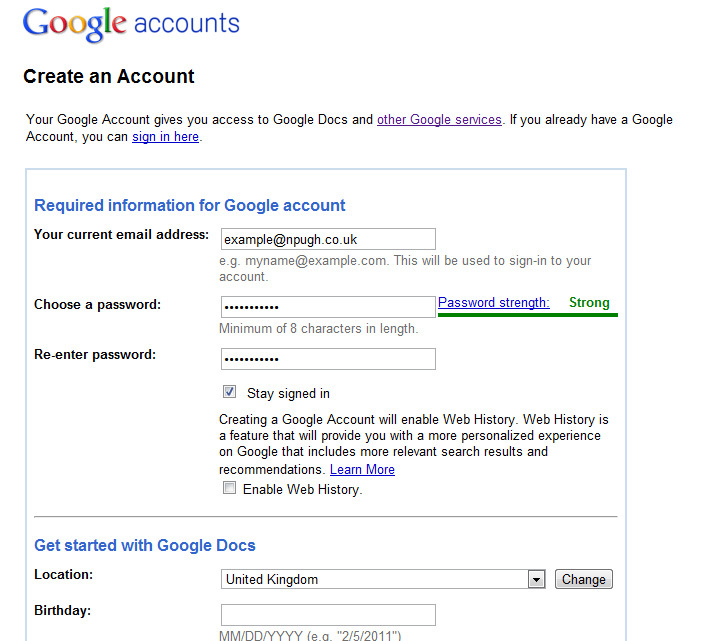 You need a Google account in order to be able to access Google’s free services. Files etc are stored online, so this is needed to match you up to your stuff. The sign up is minimal – you won’t need to share lots of addresses and personal details – and is well worth the couple of minutes spent. Do I already have a Google account? NB. A Google email account is not the same as a Google account. If you already have a Google email account (gmail or googlemail) then you automatically have a Google account and can skip a few steps. If you don’t already have a Google email account a) it’s worth thinking about – free, excellent spam filters etc etc but b) don’t worry, because you can hook up an alternative email address (eg hotmail or yahoo) to a Google account and access lots of great tools anyway. Follow this link to the sign-up page. Fill in your existing email address and give yourself a password. This will be what you will sign in with in once you’re all set up. 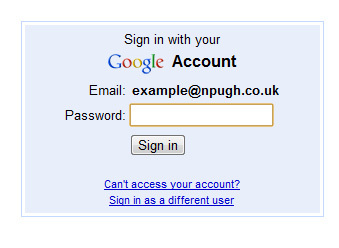 The password is for your new Google account, not the one you use to access your existing email account. Fill in the remaining parts of the form and click the button to send it. All being well, you’ll see the confirmation screen. If you’ve made a mistake filling in the form then you’ll be sent back and you’ll need to fill in the bits with red error messages again. It’s letting you know your account has been confirmed, but that you need to check your email for a message to confirm that the email address is correct. Go to your email account and open up the email from Google. If you can’t see it in you inbox, then double-check the spam folder. If you click on the last line “Click here to continue” then you’ll be taken to the next stage in the sign up process. Oh wait! There isn’t one! That continue link takes you straight to your new Google docs area! It’s empty at the moment because you haven’t created any files yet. If you go to “Create new” in the top left hand corner you can select what type of document you’d like to create. The selection is fairly standard. All good, but how do you get to your docs normally, now you’ve got an account? Click on the “sign out” link in the top right hand corner. You’ll be taken to a sign in screen. To sign in you will need to enter your email address and your Google account password. Click on “sign in” and you’ll get back to the area where your docs are kept. From here I’ll hand you over to the official support pages. If you’re comfortable working with word processors and office suites already, creating and editing documents should be fairly intuitive. It’s the collaborative aspect that makes this useful for project work though, so make sure you read the pages about sharing documents (so others can see what you’ve written) and collaborating (so others can edit the same document with you). If you’re working on a project with me, at this stage I’ll probably invite you to collaborate on a document I’ve set up. Other useful things to be aware of are things like the chat window you can use when 2 or more collaborators are online and working; uploading and exporting from and to other formats; using forms to do surveys etc and automatically enter the responses into a spreadsheet. Onwards to a shiny new collaborative future! A few weeks ago, one @kitlarks (who I don’t know) appeared on Twitter, apparently having been blackmailed to sign up in order to receive a huffing duck from, I believe, @EmmaGx (who I don’t know either). I don’t really know what the deal was, but it appeared to involve signing up, a certain number of posts and an uploaded avatar in exchange for a drawing of a huffing duck. This seemed to me to not be a Twitter-like way of approaching things. You can see the animations of the cumulative contributions here: 1, 2, 3, 4, 5, 6, 7, 8. As you can see, the internet badgers ate the huffing duck during the process of adding the head at stage 8. Unfortunate, but if you look carefully there’s a nice after-image huffing duck in glorious Technicolor burned onto your retina, and that’s perhaps as it should be. 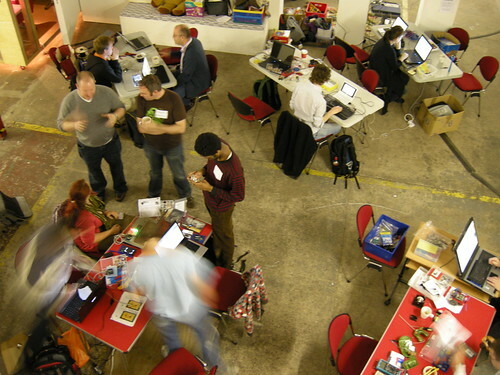 @alexhughes, @benjibrum, @graphiquillan, @haling, @lauraehall, @mookstudios, @soba_girl. A very big thank you to all involved! I want to tell you about last night’s Signtific Lab game thing developed by the Institute For The Future futures research group. Starting last night, and only for a day or so, you can respond to this scenario. From this central node you can branch off in either a positive or a negative direction. In Signtific Lab parlance, each node you add is a card. After the initial bifurcation (see, I know some Science!) you can respond to each card in 4 different flavours: “No way!” (antagonism); “Yes! And…” (momentum); “Yes! But…” (adaptation) and “Hmmm…” (investigation). You can play as many different cards as you want as a response to any other card contributed by anyone in the lab and you’re encouraged to contribute any idea you can imagine that might be possible (more information about the game mechanism here if you’re interested). Here’s the thing: it’s a really nice tool for riffing off and building on ideas. You’re equipped with 140 characters to post any given idea. Is there a Twitter feed of ideas? I’m not sure, but the character limit is great at a) removing the barrier of feeling you have to construct beautiful prose b) makes you focus on the key idea and c) makes you focus on only one idea per card/node. And that’s what you need for a mind map, right? And a dashboard so you can see what you have favourite-ed, what you have contributed and how this breaks down into the different flavours of thinking mentioned earlier. Everything (cards, responses to cards, feed items, user profiles etc) is linked. In the hypertext sense, as well as all having been born from the same starting scenario. Such a simplecomplex thing that fed my brain in a way that suited it perfectly! I always have been better at responding to things than I have been at just generating ideas out of the ether. Link. And. Shift. After this thought experiment has played out, I want to be able to see the resulting mind-map. I’ve recently started using mind-mapping tools to brainstorm ideas for projects. 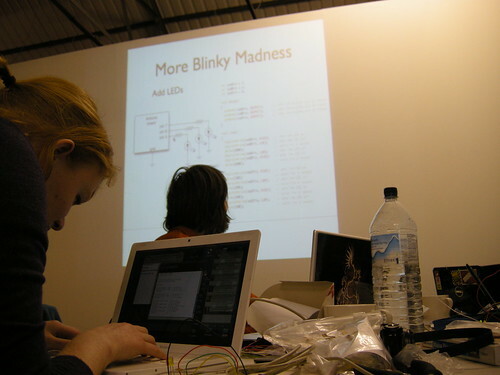 I want a tool like signtific lab to let me do this collaboratively. After that all I need is the hive of lab assistants to react to/with/against! Percussion for Hill and GPS from nikkipugh on Vimeo. The drumming and breathing was commissioned from Adam Kinner (the saxophonist from this post). He’s recently started a blog and I definitely think it’s one to watch for the future. Go have a look-see. 17 Ways… from nikkipugh on Vimeo. During the Almost Perfect residency, I had the chance to try out a few different types of thingies running off the mscape platform, but towards my 4th week in Banff I was starting to question the typical delivery format of iPaq and headphones. I couldn’t see how wandering around on your own, gingerly holding a foreign touch-screen device whilst plugged into headphones and being isolated from your surroundings related to my practice. Nothing against those other mscapes I experienced, it just wasn’t a canon I wanted to contribute to. A sight that might make some techies salivate, but kind of intimidating at the same time. These would generally be used in conjunction with some fairly substantial headphones. As a result you could very easily be worrying about if you’d pressed some of the wrong buttons, accidentally nudged the touch screen or whether you were easy prey for some street crime …rather than concentrating on whatever sounds were being delivered to via the headphones. Things started to get interesting when people paraded down the street en masse but, for the most part, the experience stayed with the person wearing the headphones. Be visible (i.e. make it obvious that something is happening, rather than skulking around wearing headphones and looking at a small screen); and be audible (inflict your happening onto innocent passers-by). These starting points later opened out into further thinkings about how to make mediascape experiences shared experiences and how to make mediascape experiences playful experiences. How these thoughts manifested themselves was through a quick prototype alternative housing for the iPaq. First I hacked (in the non-tech sense) apart and rewired some mp3 player speakers and then I mounted them inside a cardboard tube. I then had something big with a strong physical that you were very aware of carrying; something a bit shonky and made from very familiar, very non-intimidating materials; something that was loud; and something just a little bit ridiculous. A tool, a plaything, a conversation starter. With a diameter of influence of about 20 metres each. 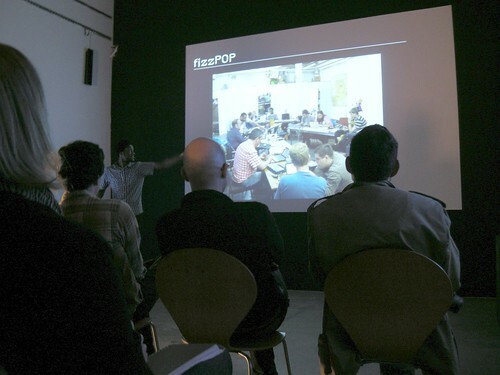 With two of these ‘talking sticks’ I had a way of encouraging interaction between people using the mediascape. We also started up a few conversations with people who had no idea what was going on …but wanted to find out! Like when Emergent Game‘s egorbeaver made friends with the ticket inspector or when Paul and some other Digbeth Invigilators found themselves in the position of having to make sure an inebriated stranger got back to her hotel safely I find these instances of when a thing bleeds out of its original context and reaches another layer of participant very interesting. It was also fascinating to see how changing the interface for the mediascape changed the way people conducted themselves. Admittedly I don’t have a huge amount of experience with mediascapes, and wandering around the corners of campus listening to piano strings being broken is probably going to foster a fairly light-hearted reaction, but there’s something different going on here, right?